Imagine my initial reaction then, when walking through the hallowed halls of the LA Convention Centre after collecting our E3 passes, we were faced with some advertising boards announcing the summer release of a new and improved edition of Gauntlet – a game I have fond memories of playing in arcades during my youth, and something on which my brother and I spent almost all of our pocket money whilst on holiday. The original Gauntlet was the forerunner of the modern day dungeon crawler, a fast-paced game of top down action, running around corridors and rooms teeming with ghosts and goblins, picking up coins, looking for food, and taking out generators to lessen the assault of the enemy to gain enough room to clear the level and move on to the next stage. It has a place of honour in my memories as one of my favourite ever gaming icons, so seeing that Arrowhead Game Studios and Warner Bros had taken this old friend and dragged it (to my mind) kicking and screaming into the 21st century brought out a very mixed reaction in me. On the one hand, I was excited that this absolute gem of a game from my past was being given a new lease of life. On the other hand, my natural scepticism and wariness of ‘all things remade’ left me feeling a tad uneasy, so, when the doors opened on the South Hall, I immediately made my way to the Warner Bros booth and prepared myself for a massive explosion of indignation and self righteous ranting at the people who dared defile my precious recollections. Arrowhead Games have taken the Gauntlet of old and have lovingly crafted a new masterpiece that retains almost all of the characteristics of the old and melded them with modern graphics to recreate a masterpiece and imbue it with all of the nostalgia one would expect of something that is almost thirty years old. I cannot express enough how well they have managed this process and how impressive it is that they have faithfully kept the detail and quirkiness of the original, yet have still given it a modern feel and flow with pristine environments and impressive effects that could well pave the way to this becoming a modern-day classic. They have made a minor alteration to the top down view of the original to that of a slightly angled view, but as it’s only really a few degrees off true top-down it retained that feeling while allowing for a proper three-dimensional effect to the dungeons and corridors our embattled heroes find themselves in. Those heroes could well be the descendants of the originals too, with the Barbarian, Valkyrie, Elf, and Sorcerer all returning to where their forefathers found fame and fortune, each with their own unique approach to battling the hordes. The Barbarian is the tank figure, best deployed up close and personal with devastating spin attacks and an axe ready to inflict massive damage. The Valkyrie, a slightly more balanced approach with spear and shield, equally at home in close, or at a moderate distance slinging her shield and sending her enemies reeling. The Elf, a master bowman able to bring enemies down from a distance with his arrows, and also able to fire a bomb shot that will devastate the massed ranks of undead. Finally, we have The Sorcerer – master of magic and mayhem, able to deal elemental damage and magical death from afar. 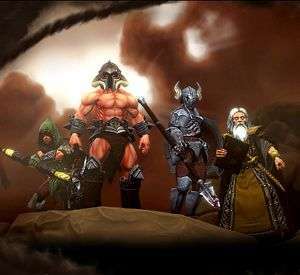 All of these are true to the original game, yet updated and applied in such a way that they don’t feel out of date or under powered and with a four-player co-op system in place it will offer the opportunity to get together with friends online. 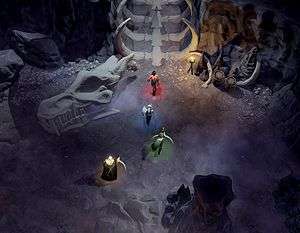 The gameplay for this remake is true to the original too, with the hordes of enemies piling towards the heroes with a single-minded determination to destroy. Some of them slow-moving and lumbering, others quicker or able to attack using magic or ranged weapons. Every now and then, there is a bigger “boss”-like opponent who is much harder to take out, followed by an end-of-level creature that is even harder. Dotted around the rooms and corridors there are vases and urns filled with coins for you to collect, and occasionally, food or drink containers to replenish health. Also, occasionally you will find some powerful relics such as boots of speed or ice crystals that will enhance your character for short periods, making it easier to vanquish your foes. The sounds and music also seem to have been lifted from the original game and given a little polish and sparkle to further enhance that nostalgic feeling and make Gauntlet a fun-filled, fast paced gem just like its predecessor. This is probably one of the best remakes I have ever come across in any medium. The guys and gals at Arrowhead must really have loved the original Gauntlet as they have recreated it with a spectacular modern feeling, yet maintained all of the elements that made Gauntlet such a hit back in 1985. I doff my metaphorical hat to them, and thank them wholeheartedly for treating this beloved friend so very gently. They have maintained the very soul of the original Atari classic and that is a rare thing in these modern times. And with that, this elf needs food… badly. i loved the original also, but there was 1 thing that i did not like about the original, and that was that the health would go down automatically over time, even when you don’t get hit. I am hoping that the remake doesn’t act that way and health only goes down when you get hit. Also I hope that there is a final boss in this one.